Sit and iron in comfort with the Miele rotary iron. This easy-to-use appliance has a wide roller that allows you to press everything from shirts and pants to bed linens and tablecloths, all with a crisp, professional finish. The electronically controlled roller speed can be adjusted to suit the type of laundry being pressed, and your own individual working speed. It is operated through the use of a foot pedal, allowing you to sit while you iron. Maneuverability and storage: The Miele rotary iron has maneuverable rollers for quick and effortless transportation, and folds away neatly for easy storage. While the rotary iron has design features comparable to much larger, industrial machines, it has specifically been designed for home use. Thanks to its clever fold-away mechanism and wheels, it can be stored in many places. A UNIQUE SOLUTION Ask Yourself. . . Do you aspire to set the most elegant table, with perfect napkins and a wrinkle-free tablecloth? Do you demand a high personal image reflected in the smart appearance of your business and casual wardrobe? If so, Miele invites you to sit and iron in comfort with our unique rotary iron. This easy-to-use appliance has a wide roller that allows you to press virtually everything from blouses and pants to bed linens and tablecloths, all with a crisp and professional finish. Professional Finish. . . Right at Home Its versatile operation will enable you to give all your laundry a smart finish. While the rotary iron has design features comparable to much larger, industrial machines, it has specifically been designed for home use and can be plugged into any 120-volt outlet. Compact Design: Thanks to its clever fold-away mechanism and wheels, it can easily be stored in a closet or left out in the laundry room for immediate use. Versatility: This unique product gently presses delicate lace or puts razor-sharp creases into pants. Unique Design: The open end of the roller is particularly useful for ironing unusually shaped items such as shirts and blouses that can be fitted over the open end without being folded. 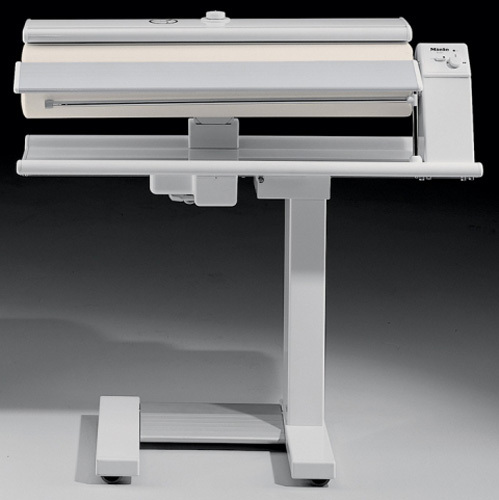 The open end also allows for easy ironing of very wide items such as sheets and tablecloths. Convenience: A clothing bar can easily be extended to help stage clothing for ironing or hold it neatly afterward. Product Specifications: Due to the weight of this product, the Miele Rotary Iron usually drop ships directly from Miele's warehouse via truck. Your presence and a signature will be required at time of delivery. Vacshack. com Inc does not charge additional delivery charges for overweight items, Please allow 2-7 business days for delivery.